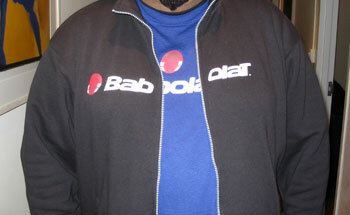 I was riding on the elevator with this gentleman and couldn’t help but notice he was wearing a matching Babolat t-shirt/sweatshirt combo. The backstory is that they’re promotional items he got when buying tennis raquets, and the double play was unintentional. He put the t-shirt on before realizing that all his other sweatshirts were at the laundromat. I gotta say, the combo is certainly more eye-catching than either garment would be alone. LOGOclash! Don’t Let It Happen to You.